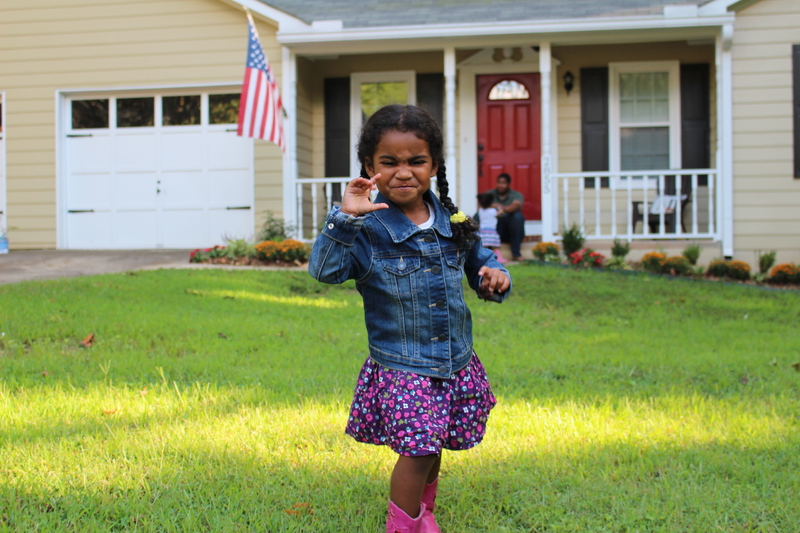 Home » Fatherhood » Making #LawnGoals with Cub Cadet! Two years ago, my wife and I purchased our dream home in Kennesaw, Georgia. Like many Southern states, Georgia is home to several sites that played key roles in the Civil War. In the city of Kennesaw, the city’s rich history before, during, and after the war is well documented through the remaining historical homes, local lore, and revered battlefields. Within the borders of our large back yard, there was documented and physical evidence that confirmed part of the Civil War was fought here. While walking around the back yard to look at some old earthworks, my foot tripped on a dark metal object gently poking up from the soil. After a careful excavation with my hands, I was happily surprised to find iron blades from a Civil War era field plow! Seeing that piece of history in my yard gently reminded me that as a family, we needed to make our own history in this house. This backyard is our fresh canvas and we want to paint a beautiful picture on it. However, we still wanted to respect the rich history of the property. With that in mind, a plan was developed that would make the backyard great for entertaining and a fun place for our two young girls without completely destroying the historical significance prior to our purchase. With sunshine and water, our lawn and plants should grow. With love, my two daughters will grow into a confident and passionate young women. I want them to have the confidence to follow their dreams and the tools to live her life with success and purpose. Whenever safely possible, the kids will continue to help with all facets of the creating and maintaining the ultimate backyard space. I also realize that I will not achieve horticultural perfection immediately and will make sure we all have fun in the process. Those are my #LawnGoals. In the backyard, there was a huge oak tree that was dangerously close to the house. It was estimated to be over 150 years old and was found to be slowly rotting from the inside out. We had no choice but to remove this primordial tree from the yard. When old trees are removed, their stumps are often left behind. They are definitely eyesores, and they can be hazardous as well. Instead of using a stump grinder to erase all memories and the cherished history of the tree, I trimmed the sides of stump and created a stone fire pit around it. It has transformed into one of our favorite places and is an inviting gathering place for friends and family. The giant tree was processed into mulch and we used it liberally in our flower beds, garden, and offered the excess to our neighbors, who happily used it around their homes. I love mulch. The earthy smell of wood in a natural and slightly decomposing state is so aromatic. My wife does not agree. I also consider it the magic elixir of the gardening world. A thin two-inch layer of mulch will inhibit weed germination and growth. Mulch also moderates soil-temperature fluctuations and protects plant roots from winter cold and helps prevent frost-heaving, a common occurrence in the fall and spring plants are literally pushed out of the ground by the natural expansion and contraction of the soil as it cools off and heats up. Managing weeds with mulch is easy, but making a beautiful lawn has been a real pain in the grass. Trying to grow grass in the backyard. My dog and daughter are there for emotional support. It may require some skill to cut grass well, but growing grass is pure science. The most important step you can take in creating and maintaining a green and healthy lawn is testing your soil’s pH with a soil test kit. They are widely available in home improvement stores. Ideally, the pH balance of soil should be 6.0 or higher for good grass growing. In general, if the soil is slightly acidic, you can raise the pH level by using pulverized lime to the lawn. To lower the pH of moderately alkaline soils, add organic material, such as peat moss. If you don’t know where to start, a local nursery or an agricultural extension office will give you a wealth of information. If you have a neighbor with great grass, don’t be afraid to walk over there and ask for tips and help! As a general rule, the best times to fertilize are in early spring and mid to late fall. When it is time to cut the grass, you need to use proper products. I know how easy it is to pick up a used lawnmower from that garage sale down the street. However, to have the jaw dropping and perfectly manicured lawn that makes you the talk of the town (or at the very least your Home Owners Association), it is vital to use the best equipment possible. From day one, Cub Cadet has focused on making innovative, high-performance products, so homeowners, large property owners, and professionals can tackle any challenge. That’s one of reasons why I love their products. Cub Cadet, the proven innovator of zero-turn technology, has created the industry’s strongest line of award-winning zero-turn riders. Their leading 360° turning technology lets you easily mow around obstacles with incredible confidence, making every mowing-maneuver more efficient. My daughter playing with her “special” flower. Soon, we will have some “special” weeds! Our lawn and yard is many things to many people – a place for me to read a good book, the site of weekend barbecues with family and friends, a playground for our kids, and even a scenic place for our dog to take an afternoon nap. Now is the time to recognize those who take pride in bringing their lawns to life – show me your #LawnGoals! To enter, capture a photo or video of your yard, tell us how you bring your lawn to life and why your yard is #LawnGoals. Share the post on Twitter or Instagram with the hashtags #LawnGoals #Sweepstakes or visit http://cubcadet.votigo.com/lawngoals and upload a photo. One winner will receive a Cub Cadet RZT L 42 KH Lap Bar Zero-Turn Rider (ARV $2,399.99), hotel accommodations for two, and two tickets to attend an NHRA event in the summer of 2017. Here’s to a season of meeting all of your #LawnGoals!